One look at the accomplishments of these musicians, will tell you a great deal about what you can expect when you come to see these boys perform. 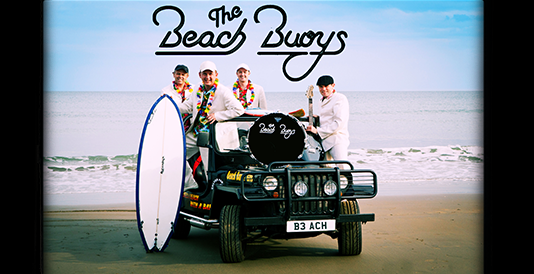 "Beach Buoys" formed in 2009 and after several months of intense rehearsals there live show was complete, and ready to tour. Within the first twelve months they performed at festivals and shows up and down the country, including several theatres, The Buoys stripped all the original songs apart and worked intensely on re-creating the authentic "Beach Boys" sound. In 2011 The Beach Buoys were asked to perform at the Isle of Wight festival opening the new "Beach Stage", where after there performance, they were asked to reappear on the last night. This year, (2012) their tour includes a ten-week run at "Warner Break Hotels", The IOW Festival (new beach stage), and to top it off they are headlining at the "Weymouth Bayside Festival", for the 2012 London Olympics sailing event. With a huge amount of past cruising experience, it was only a matter of time before they took the cruise industry by storm, and secured their first "Beach Buoys " cruise on board "Crystal Serenity". With four live vocals, and live instruments, this show is a true representation of the amazing "Beach Boys" Sound.